Jim Rohn and his Secret to Success. Early this morning I was reading a short article from Dave Dee, Chief Marketing Officer from GKIC and it was too good not to share. We all have times in our lives and our careers when we doubt our direction, what we are doing or struggle to find that golden nugget that’s going to make it all come together. The holy grail you’re searching for, does not exist. There are many financially unsuccessful people who work really hard on their jobs but not hard on themselves and therefore struggle financially. You MUST find time to read, study and then take massive action and keep doing those things to achieve success. There are no shortcuts or magic pills you can take. It never too late to start. You are not too old. You can start a journey to a new life TODAY. It doesn’t matter what happened yesterday or the day before. You can set your sail in a new direction TODAY. Will it be easy? No but the alternative is to give up and live your life in misery. Decide that you’ve had enough and get moving TODAY. 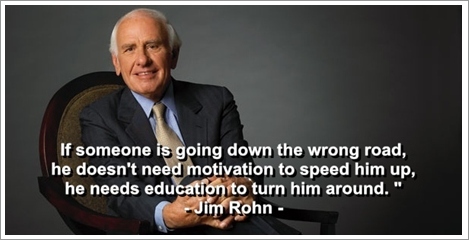 Here is an amazing clip from Mr. Jim Rohn. Regardless of where you are in life right now, I encourage you to watch it. It’s only just under 14 minutes so grab a coffee and have a listen. Jim Rohn has some powerful stuff to share. Thanks Dave for your words of wisdom and of course thanks too to Jim Rohn for sharing his profound thoughts. The long and the short of it is to keep moving forward. Keep working on yourself, keep learning and keep sharing. We’ve found first hand than there is no better way than to team up with GKIC. They send out a constant stream of excellent information targeted to get your business into top gear. Your success is their success too so I can vouch for the fact that they are committed. Don’t miss the chance to change what you are getting in business and life. Take a look at their Most Incredible Free Gift Ever and get over US$633.00 of magnificent marketing magic absolutely free when you take a trial run of their of their monthly membership. Remember the first two months membership are free and it’s holds no obligation if you try it and don’t think it’s for you. What have you got to lose? Jim Rohn would say that it’s everything to gain!